“There is a fifth dimension beyond that which is known to man”… and it’s coming to the West End. 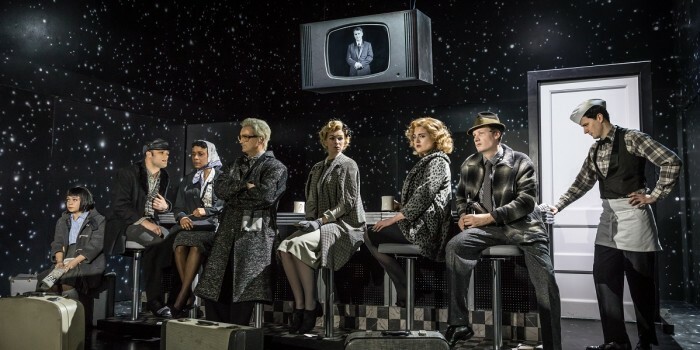 The hit Almeida Theatre production of The Twilight Zone will transfer to the Ambassadors Theatre in March 2019. Through a series of morality tales and fables, The Twilight Zone questions humanity’s dreams, despairs, prides and prejudices. The play is adapted for the stage by Anne Washburn, and directed by the multi-award winning Richard Jones. The West End transfer will come in the same year as the 60th anniversary of the seminal television show, whose influence can be found in the works of Stephen King, Steven Spielberg, Black Mirror and The Simpsons, amongst others. A new version of the television series has also entered production starring Jordan Peele. The Twilight Zone is produced by Ron Fogelman for Your Next Stop Limited and the Almeida Theatre, with Kenny Wax as executive producer. Performances begin 4 March 2019. Book The Twilight Zone tickets!